One of the world’s pre-eminent opera singers, an ambassador of American song and something of a cyber-philanthropist, Thomas Hampson is a busy man. The American baritone regularly performs at the world’s leading opera houses and concert halls throughout the USA and Europe. He has recorded more than 150 albums, and actively encourages musical and cultural education through the Hampsong Foundation. This summer, he will appear at the Royal Opera House as the Doge in Elijah Moshinsky’s production of Verdi’s Simon Boccanegra, a role that he performed to critical acclaim last year with Chicago’s Lyric Opera. Though received poorly at its premiere in 1857, the opera, which follows the fateful tale of Genoa’s first doge, is now considered to be one of Verdi’s most compelling works. 'Boccanegra is even more fundamentally a part of my musical and theatrical soul than Macbeth,' said Hampson in a recent online interview. Hampson has one of the biggest operatic repetories of any singer; ranging from Monteverdi, to major roles in operas by Mozart, Verdi and Wagner, as well as contemporary pieces by composers including Hans Werner Henze and Paul Hindemith. He often takes on new roles, most recently debuting as Iago in Verdi’s Otello, and, in 2011, he created the role of Rick Rescorla in the Christopher Theofanidis’s Heart of a Soldier, an opera composed to commemorate the tenth anniversary of the 9/11 attacks. Despite his stellar career in classical music, Hampson had no ambitions to be a singer until he was in his twenties. Though he played the piano as a boy, he admits that, at the time, he would rather have been playing baseball. He studied political science at university, and then was persuaded to start singing by a vocal coach and nun he met in his home town of Spokane, Washington State. He went on to train at Fort Wright College and in California, before making his operatic debut in 1974 in a local production of Hänsel und Gretel. Hampson is now a revered performer, recently awarded the title of "Met Mastersinger" by the Metropolitan Opera Guild. 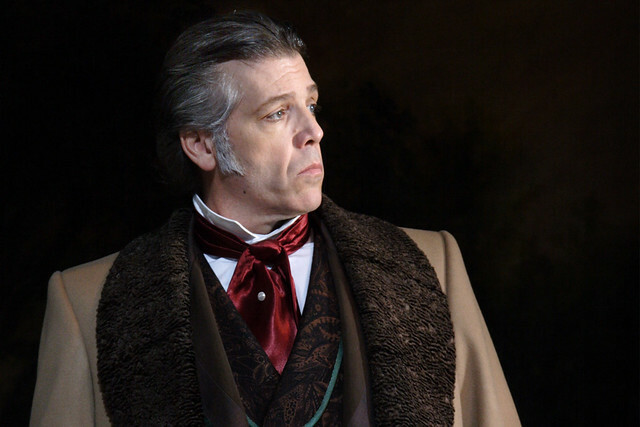 He last performed at the Royal Opera House as Giorgio Germont in Verdi’s La traviata in 2009. We’ll be interviewing Thomas Hampson early in March, before rehearsals begin for Simon Boccanegra. If you have any questions for the singer, let us know via comments on this post or via Twitter, using the hashtag #AskThomasHampson - we'll ask him a selection during our interview. Simon Boccanegra opens at the Royal Opera House on 27 June and runs until 16 July. Booking opens 13 March for Friends of Covent Garden and General Booking opens 9 April. This production is made possible through the generous support of Mrs Susan A Olde OBE, Alfiya and Timur Kuanyshev, and the Verdi Syndicate. Thomas Hampson is one of the greatest baritones in the world today. Not only is he a fine musician and actor with a noble voice, but he has the stature and pleasing personality to match his musical gifts. When can we expect something from the French repertoire? Are Mister Hampson and Mister Alagna going to sing something together in the next future?